This is Roosevelt. Rosie to some, Idgy to others. Roosevelt has a dirty mouth. I wonder if most dogs can tell the difference between good food and bad or they just simply eat? I have definitely had some picky pets in the past who would turn a nose up at 'pet food' opting for what was on my plate instead so I'm inclined to think they could be discerning. Rosie is not of that ilk though. 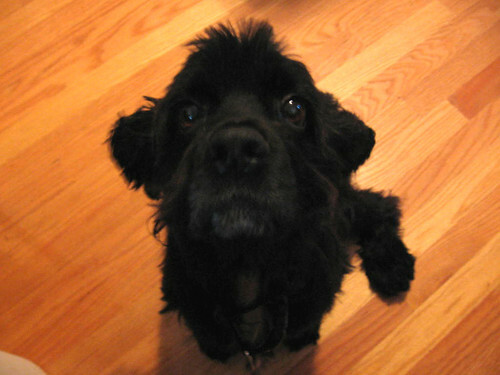 Obviously, this post's not going to be about my mother's spaniel, it's about us as foodies and coffee aficionados. We eat so much processed food and so many items that are simply of questionable quality that I often wonder what is our food culture? Do we just simply put stuff in our mouth and say, well, it tastes good with little thought to quantifying that feeling... or is there something more to it. What is good taste? How do we define quality? It brings up the thought that what I believed was great only a year ago, I doubt would make my top list now. 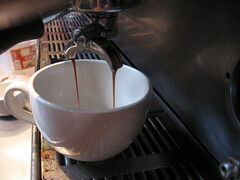 That is a statement about my evolution in coffee and the way our perspective has been shaped. 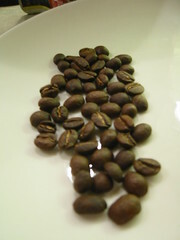 It began with fresh roast and 'not burnt' then migrated to a myriad of qualifications including how it was processed and at what elevation it was grown. I really began to notice how much our group has changed in our perspective of coffee over the last year after our most recent cupping session. Sitting at a table with Silas and Judson while Ben manned the sample roaster gave me a renewed feeling of direction in coffee which immediately made me look back on how we got there. 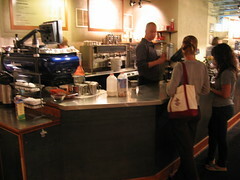 Many people getting into coffee, who use the Internet, will start with a site like coffeegeek.com. For a while, it's like an epiphany. Pull thick chocolate ristretto shots, take photos, repeat. Life was good. Then things quiet down and after a while those chocolate shots were becoming boring and a lot of people lose interest. Some people fade away and move on to other interests thinking they had mastered some angle of coffee at that point. Others moved forward and found home-barista.com and it could provide a more serious place where technical people converged and pontificated 'what if?' After time though, the mods and hacks came to an ending point where everything was PID'd including the toaster and there seemed to be little more to explore for the coffee enthusiast. A peak, not the end of the road but to the limits of experience, knowledge, ability, access, or simply budget. For me, what I naively thought I mastered long ago still remains a mountain in front of me today because quite simply, as I learn more about coffee, I realize just how hard it becomes to learn each little bit more. This potential keeps me going. That next 5% looks like Everest in the distance but it's a mountain worth climbing. It's a harrowing thought to think that with all these fancy cafes popping up and pocket emptying bids for coffee, it only means that it doesn't get easier from here on out. The competition will get smarter and tougher as everyone tries to best 'the best.' it may be jaw dropping bids for coffees that may be hot names rather than good coffee or it may lead to a roaster's renaissance where roasters compete to get the most from every super expensive coffee. I dream of that roaster's renaissance someday because then there will be so many great cups out there to be had. This reminds me how George Howell often pontificates that this industry is 'in it's infancy.' I wonder if he understands how deeply truthful that rings. We chest thump about the skilled barista, competitions, and artisan roasting while we simultaneously battle uphill to simply have a common language of what quality might potentially be. I have no criticisms to lay, only a simple question. If this is the beginning, what's next?